The 10th of March saw Bishop Justus CE School host this annual event, attended by children and staff from ten schools within the Bromley Church Schools’ Partnership. BCSP is an informal partnership of twelve Bromley schools, which share collective worship, events and RE training. 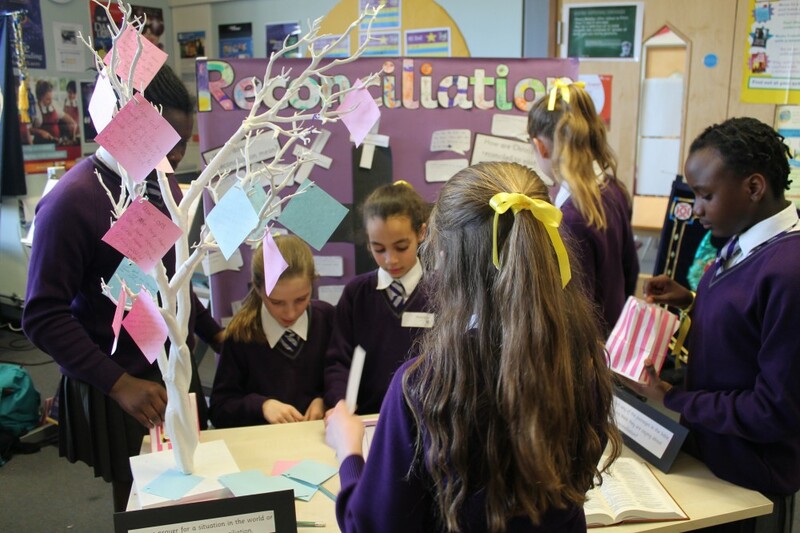 Ninety year 5 and ten year 7 children enjoyed a day of learning activities, based on themes of Easter. The day began with children splitting into three workshop groups led by Bishop Justus music staff, working on preparing a musical showcase. The combined vocal and instrumental performance raised the roof with praise and set a powerful start to the day. A lunch and then playtime on the Bishop Justus Astroturf, was followed by an interactive market place; each school providing a beautifully presented display and market stall, where children and adults could participate in a learning activity based on a theme of Easter. The day ended with groups of children mixed from the various schools, working together to debate a variety of philosophical and ethical issues, the outcomes of which were presented back to the whole group.